This is a direct cast replica of a juvenile tooth. It is 9 inches long and cast as found in the matrix. Paleontologist Dr. Robert T. Bakker stated the following: �Tinker� is one of the most scientifically significant and most exciting T.rex skeletons ever found, and one of the most important dinosaur specimens from any age and any locale. �Tinker� is the very first most complete skeletons of a T.rex youngster, an individual only one-fourth adult weight. Here, for the first time, is an opportunity to study the body build and athletic prowess of a juvenile rex and to investigate the way young rexes chewed their food �Tinker� is the first specimen that allows us to unlock secrets of the T.rex Parent/child bond. Tinker� is the skeleton of a juvenile t-rex. It is two thirds adult size and only one fourth adult weight. In human years, Tinker could well have been a teenager. Tinker is clearly a T-rex because of his teeth. Tinker�s teeth have tall, conical, slightly recurved anterior crowns. These crowns are taller relative to diameter and more circular in cross section than any other member of the tyrannosaurid family Tinker�s lower jaws hold a single nipping tooth and 12-13 tooth sockets per side. T-rexes have very distinctive teeth. Tinker has those same teeth so is a Late Cretaceous T-rex and not something else. The fact that Tinker has the same teeth as an adult T-re plus the fact that there is no indication of Tinker having had different baby teeth tells us a lot. He must have eaten the same food as the adults. 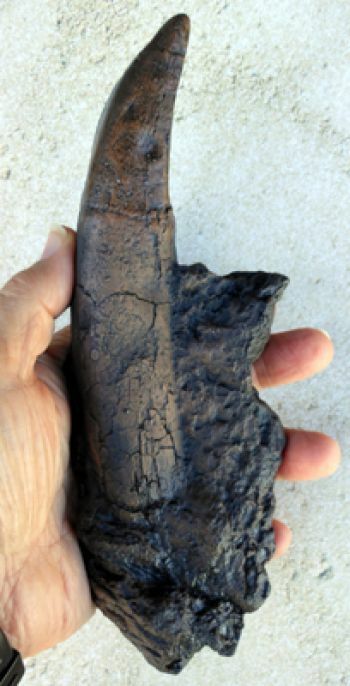 There were some acid eroded and etched duckbill remains mixed in with Tinker�s bones, indicating his last meal. It would have been a meal identical to what his parents would have eaten. As an example of what this means today, baby crocodiles have totally different teeth than adult crocodiles. The baby teeth are needle sharp for snagging insects, frogs and other small prey. Their parents don�t feed on those. They look for food on their own. Did Tinker�s parents feed him? It would seem so. It is possible that Tinker could have begun to hunt for himself but he was pretty young. Mammalian predators today, at Tinker�s age, don�t hunt. So were Tyrannosaurs like modern lion or leopards? We don�t know but finds like Tinker might help us answer these questions and many more. We don�t know how Tinker died. Maybe Tinker was killed by a pack of Nanotyrannus. Nanos were probably cousins of T-rexes. Many shed Nano teeth were found with tinker�s body. Nano teeth are sharper and more delicate than rex teeth. Did they kill Tinker or just feast on a convenient food source? The simple presence of Nano teeth is interesting and is a great example of new things that tinker will be able to tell us. When Nanotyrannus was first discovered many scientists insisted it was a young T-rex, not some midget distant cousin. Nanos were probably only half the size of a full sized T-rex. So much for that theory. Tinker�s teeth are every bit T-rex not at all like Nano teeth. We will be learning many more things similar to this as more of Tinker is freed and examined. �Tinker is one of the most scientifically significant and most exciting T-rex skeletons ever found� - Dr. Robert T. Bakker, Senior Scientist, Dinamation International Society. �A very rich mosaic of environmental data is present at the �Tinker� site. Beautifully preserved fossil leaves, stems, nuts... paint a detailed picture of the local habitat.� - Dr. Robert T. Bakker, Senior Scientist, Dinamation International Society. 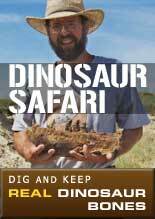 ��Tinker the Kid-Rex� soon will become one of the very best known fossils among dino fans of all ages.� - Dr. Robert T. Bakker, Senior Scientist, Dinamation International Society.